We are beyond excited to announce that Maraliner has joined BusOnlineTicket.com to offer online booking service for their bus ticket. Everyone now can enjoy greater convenience to purchase Maraliner bus ticket online through BusOnlineTicket.com. With the partnership between BusOnlineTicket.com and Maraliner, you can book Maraliner bus ticket either through our official website or our user-friendly mobile app which can be downloaded for free on App Store or Google Play Store. Maraliner is a bus company owned by the government which is based in Kuala Lumpur. 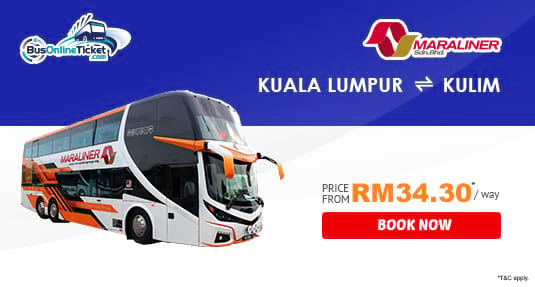 Maraliner is widely known in offering various bus services throughout Peninsular Malaysia such as bus between Alor Setar and Shah Alam, Butterworth and Ipoh, Kuala Lumpur and Kedah and many more. The bus services provided by Maraliner use 26-seater Super VIP coach type, fully equipped with air-conditioner, spacious leg-room and reclining seats to ensure their passengers can have a comfortable bus trip. The popular bus services provided by Maraliner include bus from Kuala Lumpur to Kulim and Kulim to Kuala Lumpur. The pick up and drop off location in Kuala Lumpur is conveniently located either at Terminal Bersepadu Selatan (TBS) or Hentian Duta Bus Terminal while the pick-up and drop off location in Kulim is located at Kulim Express Bus Terminal. The bus ticket price between Kuala Lumpur and Kulim is reasonably costs from RM 34.30 per way. Bus service between Kuala Lumpur and Kulim are important to those working adults and students who travel back and forth during weekend and holiday season. Instant booking confirmation is available for all ticket bookings through BusOnlineTicket.com after payment is received. Save your time and effort by booking your bus ticket now through BusOnlineTicket.com and travel with Maraliner.